Every month I can’t help but say that Close to my Hearts featured collection is my favorite! I just love them all! And for the month of July, CTMH has been focusing on the Magical collection. My good friend Christine Adams has a super simple card workshop is for the cardmakers in her group – inspired by the amazing Vicki Wizniuk! Check out her blog here, you will no doubt be inspired! I LOVE this stamp set and know I will use it over and over again! The message never gets outdated and is always necessary! It’s called Beyond Awesome and is $13.95 on my website here. You can see how simple, yet bright and fun these cards are. And the message? Do you know a teen or friend, or family member or employee or co-worker who can use a message like this? I have NO doubt! Let’s spread some cheer and lift others up! The inside message of this can be stamped with: DAY, BIRTHDAY, LIFE, TIME or anything else you want handwrite or hand stamp with alphabet stamps! 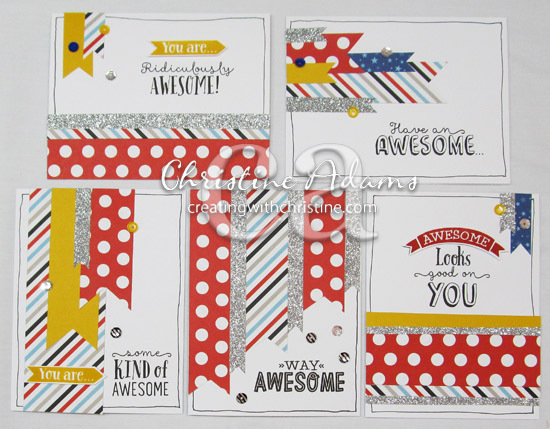 These cards can be created using ANY paper and ANY stamp set – basically using scraps! Try creating a set of your own with scraps you have laying around! Next HURRY! Only one week left!